Makani Sands #108 is on the first floor with quick access from the lanai to our sandy beach. Swim, snorkel, kayak and paddle board from our shore. Beautiful new granite Kitchen & bathroom. complete kitchen with all the necessary appliances so you can gook meals or just have coffee in the morning. Condo has tile floors, and the bedroom has carpet. large screen TV in the living room and a flat screen in the bedroom for your enjoyment. We have been staying at this place for years and love it. Marie in the office is super helpful and everyone here is casual and fun. It was easy and prompt to do business with the management. We had a great time. The landscaping is beautiful as is the view. the unit was comfortable and had everything we needed. We love the location and the fact that you can swim and snorkel in front of the condo. The free bananas from a tree on the property was a fun surprise. Been coming to Honokawai for 25 years! Either stayed at Makani Sands or Kaleialoha. Love both places, but right now Makani Sands is edging out Kaleialoha for ambience, courtes,y and making me feel that as a guest, I am ohana. Will be back next year! Ocean front condo views were great, and condo has just about everything you may need for your stay. Beautiful location and a wonderful condo. Literally turtles right outside your porch door!!! This place was clean, organized and very relaxing, would recommended to anyone looking for a place close to Lahaina and the beach. Matt is a wonderful host; very responsive and offered some great amenities in the condo itself. Five stars and more! 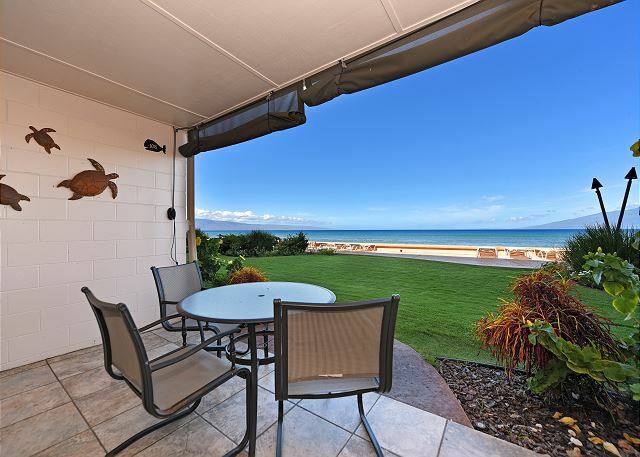 Relax on your lanai with oceanfront views! The condo was well equipped with everything we needed. We were able to cook our own meals with ease and enjoy them on the fabulous lanai overlooking the ocean. Beautiful view of Lanai and Molokai each day! We had an amazing visit to unit 108 at them at the Makani Sands! The most spectacular part of our visit was the fabulous ocean frontage view Angela nine with walk out access to the beach. The unit is charmingly decorated in true aloha style and the beds are very comfortable. Everything you need to make a wonderful meal, or just relax is at your disposal in this thoughtfully appointed unit. We are so grateful to our Hosts for sharing your lovely home with us. You will not be disappointed! VERY well equipped condo. Being on the ground level convenient for walking to lounge chairs. The gas light torches at nt. very pretty. Absolutely no biting insects outside. Location close to food & shopping. Kitchen well equipped--I did no cooking except Lobster Bisque, from the fish store. Drip grind coffee maker. Buy Hawaiian coffee when you get there. Refrig. has ice maker. The sand is gone from the beach, due to recent erosion. Other beaches available for swimming. Delightful to just watch the ocean all day, for us Seniors. Can't wait to come again!! Maria was especially helpful on the office. We had many phone conversations. The baby pack n play was helpful for our little one. Loved Makani Sands. I have been staying next door at Kaleialoha for the past 20 plus years. I decided to come to Makani Sands this time because of Kaleialoha's seawall issue. Unit 108 was just fine. The staff was attentive and friendly. The grounds around the lani were well maintained and the whole atmosphere of the complex was excellent. Full marks! My only suggestion, which I have already mentioned to the staff, is that I would recommend that the HOA put in their "guest rules" something about music on the common lani. I love music as a general rule, but I do not want to be subjected to someone else's music if all I want to do is listen to the surf. A couple of other guest used wireless speaker to listen to music while on the common lani, which means that I had to listen to it as well. That is really intrusive. Perhaps there should be a rule that says if you are going to listen to music on the common lani please use headphones--no wireless speakers please--be considerate of the others around you who may not want to hear your music. It is a good compromise and a very simple solution. Very quaint unit. We had a wonderful time and it is centrally located for all the things we wanted to do. From helicopters, horseback riding, golf, driving the island, to deep sea fishing. It was a wonderful place with the most terrific views of the ocean Molokai and Lanai. It was convient to many things and we enjoyed our time there. Because it had been closed up there, when we arrived it was very warm inside and took awhile to cool it down. We stayed at Makani Sands condo #108. It was a beautiful, bottom floor condo right on the beach! We walked outside and the beach and ocean access was right there. We had an issue with our shower one morning, but when we came back it had been fixed and worked perfectly after that. The staff is super friendly especially Burt who's one of the property managers. He was great to talk to and was always friendly. We definitely recommend Makani Sands! Lovely grounds, with beautiful gardens and a nice gentle sand beach. Condo was immaculate and fully equipped. A Fabulous Find!! Wonderful time with friends ! We had a fantastic time! Bert the daytime property guy is AWESOME, very helpful and nice. One thing is the tiny little bugs in the unit, not harmful, just annoying. Check in very quick and efficient, free convenient parking. A gorgeous view with the ocean literally right out the door. Very nice, sandy beach and turtles to swim with well maintained landscape. Basic cooking utensils but no spices or even salt and pepper. Clean but many tiny bugs, proably common in this climate. We had an excellent time in Maui. Our stay at Makani Sands was great. We had everything we needed. The Ocean View IS ABSOLUTELY STUNNING! The photos are beautiful, but nothing compares to experiencing the views and the sounds of the waves. We enjoyed coffee and lounging every morning and evening. We had a visit each night from a big sea turtle who seems to make the beach in front of the complex his home. We walked to various shops as well as a great Farmers Market just down the street. The location allowed us to easily go out for day visits around the island. We enjoyed travelling the Road to Hana...although it was a BIG DAY trip, coming back to the condo in the evening and relaxing after the long trek around the island was VERY relaxing. 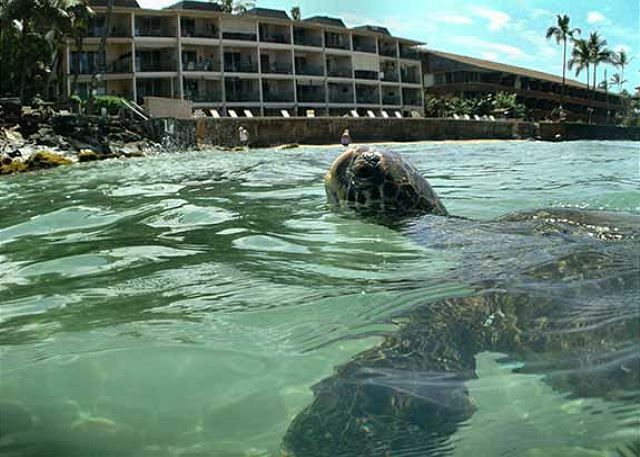 (check out the Maui Winery and Grandma's Coffee house too) I would stay at Makani Sands again for sure! The saddest part was having to leave....Aloha and Mahalo Nui Loa!! PS. Go to Costco for all your macadamia nut needs! Good Location and lovely views from the lanai. Ground floor condo with easy access to the garden and beach.generally quiet although not many children about and for the majority of our stay there was no one above us or to one side. Fantastic views across to Lanai and Molokai with some great sunsets. Condo itself was well equipped although some electric sockets did not appear to work. Washer/ dryer in cupboard, not easy to access. Bedroom at the back of the unit was small and dark. Large shower unit made amends. Good property for 2. 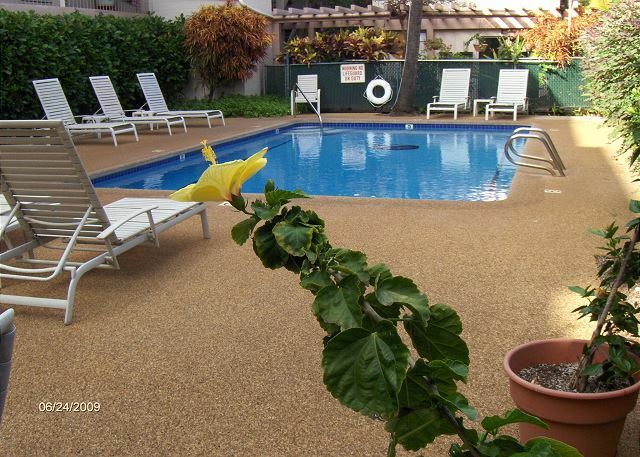 Easy parking, lovely gardens and nearby Beach Walk and some road walking enables you to get to Lahaina. The condo had a beautiful view, not crowded on the beach and great location. But it would have been nice to have air conditioner, because it was very hot, even for sleeping. We also had an issue with little ants ant cockroaches in the kitchen cabinets. Starting from my contact with the owner, Matt Miller, I had a good impression that the owners and managers were nice and professional. The unit is located on the first floor of a four-story condo building by a private beach. The bedroom is small, but the kitchen and living room are a good size. The cleaning fee was a little steep, but the condo was very well-kept even though we did catch a few cockroaches. The beach is small but very nice, and is also the best in that area which hosts many condo buildings. The area has easy access to shops and restaurants, and is a short 10 minute drive away from two larger tourist towns. The sunset view from the condo is stunning! Overall, it was a great experience. We would love to stay here again. I miss going out every night and seeing the turtle(s) asleep on the beech, waking up to the gorgeous crystal blue sea and snorkling outside the condo. We enjoyed the trip and it was one of the best trips. We loved the condo. The bottom floor was great because it felt like the outside was an extension of the unit. We ate breakfast on the lania and listened to the waves. The rooms were very comfortable and there was this awesome breeze that went threw it. It was a great location. I liked the fact there is a strict 10pm noise curfew because we did not have to listen to parties. It is a nice 30 unit small building (which we loved). It was the few in the area with an actual sandy beach as well as coral. We will be back for sure. It felt like a home away from home. You cannot beat the water access! Can watch the turtles during the day. Some of the turtles beach themselves at night to sleep. Very nice updated kitchen. This unit is right by the elevator so you can hear everyone when trying to sleep. Would be nice to have an ac unit in the bedroom so you can sleep in without hearing outside noise while keeping cool with the window closed. Can always put the bed in the living room I guess to hear the waves but then you have to have the patio door open which is a security hazard. Plenty of extra pillows in the closet which is a must. Thought we were having maid service but did not. Guess the cleaning fee was for cleaning at the end of the week? Nice washer and dryer in the unit. Water stains on the popcorn ceiling in the living room, dirty popcorn ceiling in the bedroom, inside of bathroom door frame needs painting and the outside light was missing a bulb and was broken. A wooden fish with shells glued on it that was supposed to hang on the wall was broken and was just sitting on the patio table. Mismatched chairs. Not huge problems. It just gives the appeal of the beach front access condo a bit of a tarnished look. Could use another couch as well in the living room. Again, not huge problems but could be remedied with just a little TLC. Overall, a great unit and a great location close to amenities. room was boring and many watermarks on ceiling. furniture was sparse and old. tv volume would not work well in liv room. kitchen was ok. have stayed at makani for many years,this room did not make me us feel special on our vacation for the price of room.mediocre. the sun and tradewinds and turtles were the best. Rosanna and Arlene are fab. Thank u for all ur help.Will notstay in that room again. We had a wonderful time. Bert made our stay especially enjoyable. We will be back. The location can' be beat if you crave the ocean! Literally on the ocean, nice sandy beach where you can swim with sea turtles! Very nice grounds that are attended to daily. Most necessities are provided, kitchen has the basics. Appreciated the beach toys and towels, snorkel gear, and scale. The rates have steadily increased over the last few years so frustrating to also pay the cleaning fees, would be nice to have maid service with fresh linens on extended stay (past 14 days). Small washer/dryer is helpful but very hard to dry towels and sheets. This was our third time staying at Makani Sands but our first time in #108. The upgrades were lovely! I would like to add that upgrades could also be done in the bedroom (tiles instead of the carpet like in the rest of the condo). The bed was wonderful and comfortable and kingsize! One drawback with 108 is that it is not as quiet simply because it is close to the entrance of the condo so extra noise because of that, therefore for that reason, it would be nice if one could completely close the bedroom window but you cannot. We were aware that there would probably be more noise because of where it was situated. Because you can achieve a continual flow of air throughout the condo, air conditioning is not needed. What we really love at Makani Sands is beach/ocean front which gives everything such an open feeling. For us to be right beside the water is what we love. If we don’t feel like going to a beach – it is right there and you can snorkel right in front of the condo and a good place to learn if you have never done it before. When we did have some issues, they were dealt with very quickly by Roseanna or Bert. I don’t go on vacation expecting perfection but probably do expect to be looked after if there are issues of any sort and am pleased that this happens at Makani Sands. There were lawn chairs which we definitely used when we went to other beaches but a cooler would have been nice to have. And also they had boogie boards and snorkeling equipment of which we did not use. We always rent our snorkeling equipment from The Snorkel Store (highly recommend). The barbeques are not far from the condo. Thank-you to the owners for the upgrades but probably the bedroom needs a little work like the carpet looks like it should go and some of the slats on the bedroom window on the outside kept falling out and we would have to go fix them up. There were a few other areas that could probably use some attention. Thanks! Phyllis W from Gresham, OR does not recommend this vacation rental. Do not take room #108....bedroom was next to only elevator and stairs in the four floor complex. I am sure that #107 and #109 are almost as bad. However, the other rooms were very well furnished. Ours was very scarce and had no table for dining. Also it has never been remolded like the others. My family of four (two boys ages 8 & 11) stayed in this place for 9 days in December and had a great time. This is right off the beach so it is very convenient. We saw an eel, leather back turtle, green sea turtle, and whales right from our lanai. Great location, for swimming, snorkeling or just watching the turtles. Our honeymoon! Great location - excellent. However, I had no idea there was no A/C. We sweated profusely our entire honeymoon; kinda sad. 90 degrees inside the condo. We had to constantly take cold showers and Kay still by the fan. The condo was beautiful, the location was amazing! Would stay again if A/C was added. We were able to enjoy ourselves enough. It is satisfied with wonderful natural environment, the orderly equipment, and hospitality. The location is fantastic and the people we met from other units were too - especially Judy! The ceiling in our unit had some water damage that needs to be addressed.